I recently did a review of home gym machines and I felt bad that I snubbed the body weight group of products. Well, I did so on purpose, because I wanted to devote an entire article to the discussion of The Total Gym XLS. I know you’ve seen them on tv, the infomercials have been running since the ’90s. But, is The Total Gym XLS the “total” package (pun intended)? Let’s find out! -Once a cobra bit Chuck Norris’ leg…after 5 days of excruciating pain, the cobra died. Ah, I love Chuck Norris jokes. I have zero idea where that all started, but it’s pretty awesome. As is Chuck Norris. We all know him as the badass from all the martial arts movies, or as Walker that do-good Texas Marshal that always showed up at the right time to take out the trash. Regardless of your favorite Norris character, one thing that can all agree on is that Chuck Norris is the man. Well, The Total Gym company was wise enough to get him in on selling their Total Gym products. When you see celebrities selling products, you never know what is real. We know that they are being paid to say they like said product. But do they actually use what they are selling? Do they actually stand behind the product? Who knows. But according to Chuck and Total Gym, he does use it and has been for the last 30 years. By the way, Chuck is almost 80 years old (77)! Whatever he is doing, it’s working. He still looks pretty formidable. As a martial artist, it would make sense for him to use a piece of equipment like the Total Gym. We will get more into this in a minute, but one of the great benefits of these products, is the fluidity of the movement. You are using your full range of motion (ROM) as you exercise. Not only does this increase strength, but it maintains flexibility and promotes that smooth, fluid like movement the martial artists need. Christie Brinkley has also appeared in the infomercials for the Total Gym products. Christie, arguably one of the most beautiful women around, just recently appeared in Sports Illustrated again…at the age of 63. Yea, wow. She is another Total Gym user…or so we are told. If using the Total Gym will get me in Chuck Norris or Christie Brinkley shape, I’m in. Just to make sure though, we should probably discuss the actual product first. -Chuck Norris plays Russian roulette with a loaded revolver…and wins. I was first introduced to the Total Gym through work. When I came out of PT school, I started working at an outpatient clinic. We saw patients with varying diagnoses, lot of knee pains, back pains, joint replacements. We had a Total Gym in our clinic and it got used daily. I quickly learned why. The great thing about the Total Gym is that it is super low impact. Very little stress through the joints, which makes it ideal for folks going through therapy or who have arthritis. The idea behind the machine is that all of the resistance is produced by the user’s body weight. This resistance is increased or decreased based on the angle the back is set on. By adjusting the height (or resistance), you are increasing or decreasing the amount of gravity you are fighting against. If I lower the back (closer to the floor), I’m decreasing gravity’s effect, and the exercise becomes easier. If I adjust the back higher, I am increasing gravity’s effect, and the exercise becomes harder. Think about doing a push up on your knees, vs standard on your feet, vs elevating your feet on a bench…same idea. More gravity = more body weight = more difficulty. In the clinic, we used it all the time for squats, single leg squats. Some rows for our shoulder patients. Simple system, but genius. Perfect for rehab. But also great for providing healthy individuals a world class workout in their homes. Basically, the more expensive the model, the higher the max user weight is and the more exercises that can be performed. That said, the Total Gym XLS offers over 80 exercises… I can’t imagine the need to do more than 80 exercises, but the Total Gym GTS (the most expensive model) boasts over 200 possible exercises! I’m “totally” in! Yea, the Total Gym XLS is definitely the total package (I promise this is the last time I will say that). It offers a full body workout that is low impact, comfortable, and easily adaptable to any fitness level. There is no assembly required, comes with 5 workout DVDS, and only takes up about 8 ft worth of floor space. It’s a pretty awesome machine. Again, I love how simple the idea is. You have a pulley system and a glide board, the rest is up to your imagination. I just briefly mentioned it above, but one of the biggest benefits of the Total Gym XLS (and any other model for that matter), is how fast you can switch between exercises. We are talking seconds, or no time at all if you are changing between upper body exercises. Think back to those Chuck Norris infomercials… he would switch between chest press, chest flys, lat pulldowns, tricep extensions without stopping. Doing this turns your strengthening exercises into a cardio workout…which is a good thing! Decreasing that wasted time between switching exercises is going to allow you to burn more calories, burn more fat, and do so in a shorter amount of time. Not to mention the cardiac benefits of keeping that heart rate elevated for longer periods. This type of fluid movement that allows you to take advantage of your full ROM will help keep you flexible as well as increase strength gains. Let’s talk price. I think the price is pretty fair. You are well under $1000 here and you are getting access to over 80 exercises as well as the workout DVDs and nutritional plan. You can get cheaper products through other companies, but buyers beware: you get what you pay for. Total Gym is a trusted manufacturer that has been making these products for a long time and the XLS is backed up with a nice manufacturer’s warranty. If the Total Gym isn’t what you are looking for, check out this article on the best home gyms currently on the market. Let’s finish with a couple more Chuck Norris jokes, why not? -There is no theory of evolution, just a list of creatures Chuck Norris allows to live. -When Chuck Norris was born, he drove his mom to the hospital. -Chuck Norris threw a grenade and killed 50 people, then the grenade exploded. Hit me up with any questions or comments and I’ll get back to you soon. Chuck Norris is amazing. It’s hard to believe he’s almost eighty. What I like about the Total Gym XLS is the concept of using your body weight for resistance. I don’t own this machine, but I have owned machines like this one. I have also tried working with weights at the gym and I found this machine is much easier to use. With weights you need a spotter for safety reasons. You will not need the spotter with the Total Gym. Plus you can move through your workout more quickly – no wait time. This is a sharp looking machine! Yea, that’s a good point on the spotter. I agree this is a very safe machine to use, easy on the joints. Thanks Don. 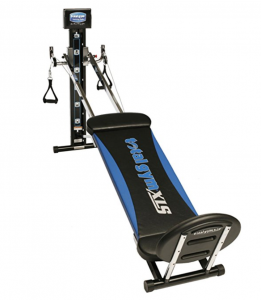 I am currently in a physical rehab program at my local hospital fitness room, and I am loving some of the machines that they have, so I can really see the attraction to the Total Gym, and this xls model. The ability to do all my exercises at home would sure be a plus! I know that there were some issues with older models of total gym, such as people hurting themselves while setting it up. Do you think the problems of the past have been fixed with this newest model? Hi, thanks. Yea, the XLS is a piece of cake to set up. There is no assembly required, you basically unfold it and set your height to whatever level you want. No tools necessary. Total Gym has done a nice job with designing this system to make it ready to use right out of the box. Good luck with the rehab!